bl.uk > Online Gallery Home	> Online exhibitions	> Asia, Pacific and Africa Collections	> Monolith stones, Shillong. 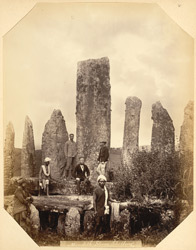 General view of standing stones photographed by Oscar Jean Baptiste Mallitte in the 1860s. A group of six men, including three unidentified Europeans, are posed in the foreground. This area is scattered with a number of ancient stone monuments erected in honour of deceased ancestors. Situated in Meghalaya, ‘the land of the rain clouds’, Shillong has often been referred to as ‘the Scotland of the east’ due to its scenic rolling hills. Meghalaya is one of the wettest regions on earth; the lush hills contain many waterfalls which are brought about by the Monsoon-laden winds that come off the Bay of Bengal.